By Emily Boyd Hundreds of students and teachers gather outside the Student Activities Center on a brisk Wednesday afternoon to learn more about the study abroad opportunities that the University of Texas has to offer. Hundreds of colorful banners, posters and flyers together under one billowing white tent to advertise one of the most exciting college experiences. 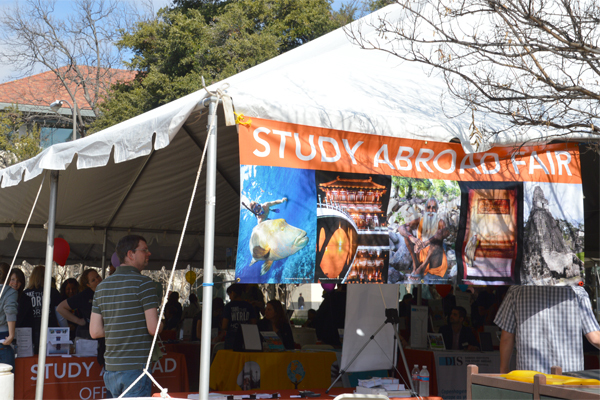 The faculty-led Study Abroad Fair, an annual event held this year on January 23, is intended to recruit students for an international learning experience. Student advisors, program directors, study abroad veterans and exchange students lined the dozens of booths, each representing a different global opportunity. Studying abroad has become something the present generation of college students values and cherishes in a way unlike any previous generations, and according to the Institute of International Education, the popularity continues to grow. A report from the Institute of International Education depicts a 126 percent increase in the number of students studying abroad between the years of 1992 and ‘03, in spite of a failing economy and post-9/11 concerns. “Around the time of globalization is when people started to look at studying abroad more seriously. We began to see that all the information is the same across the nations,” she says. “We’ve learned that education goes beyond academics,” says Ronda Barnett, UT Austin academic advising counselor. The Institute of International Education also attributes the steady growth of global education to more active recruitment efforts, the growing reputation and visibility of international programs, and more international linkages. 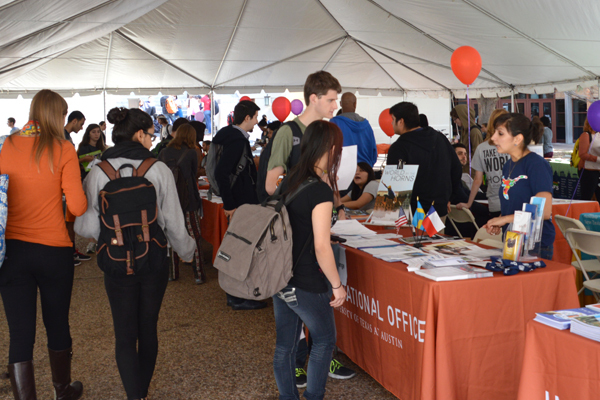 “The Study Abroad Fair is the biggest event that catches students’ attention, but we’ve also begun to utilize our campus facilities for advertising,” Barnett adds. The Belo Center for New Media now uses multiple monitors on the ground floor to post students’ pictures from their study abroad experiences. “It takes it to a new level when you actually get to see what your classmates have done,” Barnett says. In the midst of difficult financial times for students and heavy budget cuts on university programs, study abroad rates continue to climb. According to a recent poll from the IIE, 273,996 American students received academic credit for studying abroad in the 2010-‘11 school year, a 1.3 percent increase over the previous year. Unstable economic times have not deterred the university from supporting international programs. The University of Texas offers more than 650 programs a year, according to the University’s international office, along with numerous scholarship and financial aid opportunities. UT’s study abroad office offer eligible students a combination of loans and grants, and also organize financial planning timelines to help students manage the travel expenses. And according to the study abroad website, every student is eligible to apply for at least one scholarship, the International Education Fee Scholarship, which will help offset the cost of study abroad. GLOBAL ASSIST, the online scholarship portal, has links to further scholarship opportunities, and match students personally with the scholarships that best match their situation. There are also various types of programs available, from Maymester terms that allow a shorter and more affordable commitment, to semester exchange programs. “I am a journalism and communication major in my college, so when I came here I wanted to take different classes. This semester, I am taking a criminology and sociology class, and classes in human nature, which are things that I could not have studied back home,” says Selina Ng, an exchange student from China. King Yau, another exchange student from Ng’s school, looks forward to his experience over the spring semester.